Being the naturally rebellious type, I had no desire to “spring forward” today. Why should I? I thought. Simply because they are telling me to? And who are “they,” anyway? I got myself so worked up over the matter that I seriously debated boycotting it. Set my clocks forward an hour? You can’t make me! I envisioned this grand plan in which I would keep all my clocks set at Pacific Standard Time, year-round. I would become the Arizona of the Pacific Northwest. The Grand Canyon State doesn’t observe Daylight Savings Time and their civilization has yet to collapse. Phoenix may endure blisteringly hot summers and cloyingly stringent immigration laws (ooh – four-word political rant! ), but I envy their independent spirit. This could work for me, too. I would simply have to adjust my way of thinking. If Survivor comes on at 8:00, well, I’ll just know that means 7:00. Likewise, if I have a job interview or a dinner engagement or a pedicure appointment (what?! ), I’ll just remember that it’s an hour earlier for me. I may not be a math whiz, but subtracting one is something I can handle easily enough. I was really warming up to the idea, too. Gone would be the obscenely late summer sunsets, where the sky is still light at bedtime. Restaurants would be less crowded since I’d be eating “later” than most people. This might actually work! I told myself last night, and it had nothing to do with the wine I was consuming. Only, it won’t work, because I have custody of the kids every other week. Synchronizing our schedules would be a real chore. By the time I rolled out of bed in the morning, they’d already be late for school unless I set my alarm an hour earlier – which, of course, defeats the whole purpose. Rats…foiled again. If I were childless and self-employed, though? My noon would so be your 1 PM, suckas. Not quite ready to surrender just yet, I quickly formulated a Plan B. Instead of setting my clocks forward, I would turn them back, thereby gaining an hour instead of losing one. Yes! This was perfect! I’d take advantage the evening before, ending up with a longer Saturday night and an extra hour of sleep, and then I would simply move the clocks ahead two hours during some unobtrusive part of today. I might turn 3:00 PM into 5:00 PM in one fell swoop, but who cares by then? The best part of Sunday is already history. Plus, I’m suddenly that much closer to watching The Amazing Race. Win-win, right? I thought this was a particularly inspiring plan, and it contained but a single drawback. I didn’t think of it until today. After I’d capitulated and obeyed Congress and gotten with the program and set my clocks ahead. I entertained one final anarchic thought, shortly after 1 PM; I would reset my clocks back two hours to give myself another hour of morning (my favorite time of day), and then set them ahead again by three hours after a couple of hours had passed, but the logistics involved in this were too great and I was starting to get a headache, so I took a Tylenol and gave up the idea. There’s always next year. It’s all Benjamin Franklin’s fault. OK, he had a few good ideas in his time – the whole “discovery of electricity” thing was pretty newsworthy, and we’ll give him kudos for bifocals – but he also suggested taxing candles and shutters and firing cannons at sunrise to force people out of bed earlier. He may not have invented daylight savings time, but he planted the seed. Boo on you, Ben! I’ll never look at the $100 bill the same way again! The concept just doesn’t make much sense to me, and is full of contradictions. We’re supposed to save on energy costs by using less electricity (fewer lights) in the evening – but isn’t our energy use just shifted to the morning hours instead? And with more evening sunlight, aren’t we running our air conditioners for longer periods of time, thereby using more energy? If I were a politician, here’s what I would propose: next year, we set our clocks forward 1/2 hour – and leave them that way! No more tinkering around with the concept of time. 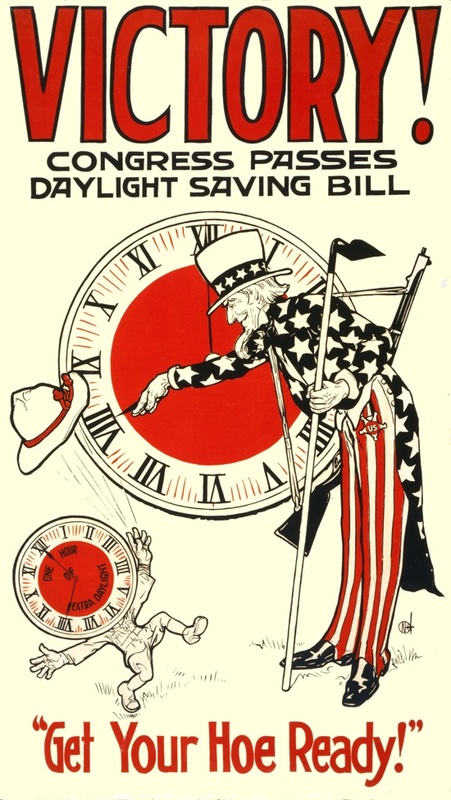 This way we’re reaching a compromise: we still get some extra daylight, but not too much to inconvenience anybody, and we never have to fuss with our clocks again. Critics might argue that this would throw off time zones worldwide, but there are some countries that already choose half-hour increments for their local times, and they are shining examples of prosperity and democracy. Places like Iran and Afghanistan and Burma. Ooh…I like that idea, Jonna. Come November, you’ll have fewer clocks to set back! Fabulous post! This morning the Brown-eyed girl and I were chatting about this–well, she was super hacked off since she had to get up that hour earlier to get her rear in gear to go to Seattle for the closing show of Next to Normal. I only just showered and got out of my pajamas into daytime clothes…so, no skin off my nose this time. plus, it makes the falling back in November that much more blisteringly horrid. also, get a tattoo or two. I love love love my two and am planning the 3rd. I hate daylight savings time with a purple passion! HAHAHAHAHAHAHAHAHA! I feel the same way every single year. Since I’m more of a night person rather than a day person, I can’t stand how LONG the days are during the summer. I love when it gets dark at 5 p.m.
find a fabulous artist, spend what it takes to afford the fabulous artist, and enjoy! I don’t mind a little bit of pain. Thanks for the advice, Jane – I know you get what you pay for, and when it’s your body getting inked, I think it’s wise to pay a little extra to ensure quality work! Oh, man. It’s one thing to hate something with a gray passion, Ron. Or a brown one. But a purple passion?! That’s some extreme dislike right there! While I hated losing an hour of sleep, I really liked leaving work at 7:30 tonight and it still being somewhat light out. Hallelujah! The sun, I’d forgotten what it looked like! By the by, happy not to see any news reports about the weather from your end of the country. I saw some of the storm reports and was worried about my west coast friend. Earthquakes, tsunamis, torrential winds, oh my! We had a squall line move through about 4 hours ago. Torrential rains, strong winds, downed trees, power went out for 90+ minutes. I even posted pics on FB. There’s some crazy stuff happening! Haha! Crazy minds think alike. I’ve been wracking my brain trying to figure out a way around this time change junk! I think I’ll take a cue and blame my kid AND Benjamin Franklin for this mess. P.S. Please contact me immediately (via comment or smoke signal) to let me know if you have a plan C or D or even E that works. I’m in. I’m thinking the way to get us all behind the idea of losing an hour would be to make the Spring Forward happen at, say, 2PM on a Monday. I would happily give back an hour in the middle of a weekday, and if it’s a Monday, so much the better. Of course, I want my Fall Back reset to happen on a Saturday… hmm, how will I trick Corporate America into buying into this. Ha – this is the best idea yet! 2 PM on a Monday? I’ll bet you’d have 100% approval for that idea! Well, 99% – CEOs might be against it. I just hate late June around this part of the country…it’s light at 4:45 AM and still light at 10:45 PM. When I was growing up, Indiana also held fast to their own time because the farmer liked having the sun come up at 4:00 during the summer. But the state gave in a couple of years ago (my parents still resent it). Since my bed time was ruled by my parents, I always thought it was a gip that all the TV shows were on earlier in the summer when I was allowed to stay up later. Now I just look forward to fall when I get my hour back. I knew that about Indiana. I used to work for a company whose headquarters were in Indianapolis. Every spring and fall we’d have to readjust our thinking whenever we tried to contact corporate, which was a real hassle. I always admired IN’s free spirit, though!